HÀ NỘI — Việt Nam is forecast to be the fastest growing convenience store market in Asia by 2021, according to new data released by international grocery research organisation the Institute of Grocery Distribution (IGD). It is followed by the Philippines and Indonesia, the Bangkok Post reported. Asia’s grocery market is the largest in the world, with a predicted 6.3 per cent compound annual growth rate up to 2021. Its size is forecast to reach US$4.8 trillion by 2021, equivalent to Europe and North America combined. 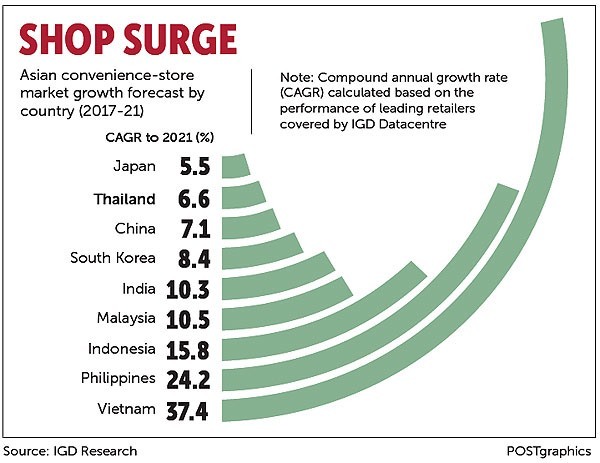 In the convenience channel, IGD has forecast high double-digit compound annual growth over the next four years in Việt Nam (37.4 per cent), the Philippines (24.2 per cent) and Indonesia (15.8 per cent). Nick Miles, head of Asia-Pacific at IGD, said: “The retail markets in these three countries are gradually shifting from traditional to modern trade and there are several factors driving this -- positive economic outlook, significant increase in GDP per capita, deregulated markets encouraging more foreign investment and rapidly changing shopper habits. Việt Nam, the Philippines and Indonesia, according to IGD, share some characteristics that make their convenience markets ripe for growth. These three markets are predominantly driven by an increase in store numbers. For example, the number of convenience-stores operated by the top five retailers in the Philippines has more than doubled in the last five years and retailers are shifting their focus from the capital to more provincial areas. Asia’s convenience market has traditionally been dominated by Japanese retailers. However, there have been more market consolidations and partnerships, and most noticeably, domestic players such as VinMart in Việt Nam and SM Retail in the Philippines have been scaling up their operations.